The SURREAL CUBE will be my MONUMENT. The short story THE MONUMENT was published in rezmagazine in September 2016 and the corresponding installment is presented at the SANTORNI BIENNALE – in the section IMMERSIVE INTERACTIVE ART – IMMERSIVIA. THE MONUMENT shall demonstrate that a vision, a concept, I sent in to the jury of Linden Endowments of the Arts can work as a world wide collaboration. I have to thank JMB Balogh, headcurator of LEA, PatriciaAnne Daviau as my former liaison manager for the MOONREZZER AIR grant and the SURREAL TOWER core grant and Dove (TheDove Rhode) LEA advisor and liaison for the trust to give me again a full sim for six month. Three grants in a row make a lot of pressure to show that again the universe will collide the borders are expanded, the impossible becoming possible. We have to leave gravity behind. We have to be THE 100, we have to be THE 300. Or shall we be always autonomous? “What is this here?” asked my friend Meri (Merivale Ewing) as I gave her a preview. I know she is always so busy in making new dresses and I had to type fast and use short words. [2016/08/18 00:31] Meri: Explain please? [2016/08/18 00:35] Art Blue: you see Dr. K, the noob? [2016/08/18 00:36] Art Blue: you see sun? [2016/08/18 00:36] Art Blue: and moon? [2016/08/18 00:36] Art Blue: the fences you see? [2016/08/18 00:44] Meri: where are you? You see, I sadly could not bring in why the fish, made by Moewe Winker, the boxes Meri called them not realistic, are digital dadaistic representations of the natural fish which are extinct in the times SRHadden is coming back from a travel through the universe. You will see more here as soon as the installment is presented in Santorini – Grand Opening Septemeber 1st, 2016. 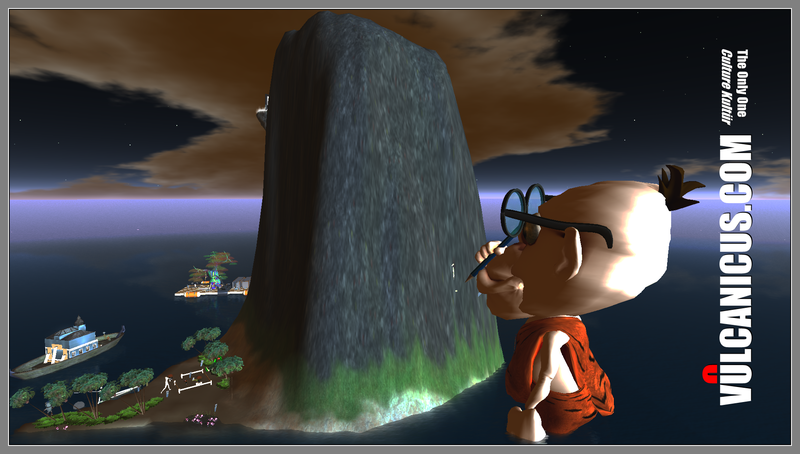 I, Art Blue, was set in as curator of the IMMERSIVIA, the first time where virtual art is being presented in a Biennale along the classic art fields, like painting, scultpure, photography. For the SURREAL CUBE the following artists set their views in place. Mistero Hifeng, Italy: the landing of the stronghold. Hyde Hackl, Netherlands: builder of the Molly Bloom Museum and The Egg. Renn Yifu, Germany: Dr. Kawoom.